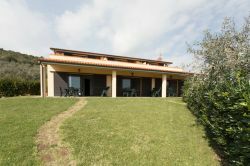 The holiday apartments Pian di Rocca are situated in the countryside between the sea of Le Rocchette and the small countryside hamlet Pian di Rocca, outside the seaside resort Castiglione della Pescaia Maremma Tuscany. Pian di Rocca is situated in a very peaceful setting, just 6 km from the center of Castiglione della Pescaia and not even 2 km from the beautiful sand beach Le Rocchette. The building lies next to the owner`s house and is subdivided into 3 comfortalbe holiday apartments that can accommodate 4 guests. In front of each apartment a veranda with table, chairs and sunbeds for outside dining. Each outside space subdivided from the other throught plants. In the fenced garden there is a barbecue. From the house there is a charming view over the typical cultivated countryside. It is adviceable to bring bikes with you (if not possibile, you can rent them in Castiglione), thus you can reach the Rocchette beach easily, without need to search for parking, following the small asphalted road. There is also a small grocer`s shop (fresh bread), a newspaper stand, a restaurant and tennis courts. 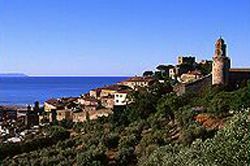 Castiglione della Pescaia has quite antique origins, dating back to about 60,000 years ago. The first human settlement was founded by the Etruscans at Vetulonia, situated at that time on the Prile lake that today disappeared. Even for the Etruscans, as later for the Romans, the lake was of great importance, as it had huge salt and fish resources. Where once was the Prile lake, there is today the Daccia Botrona marsh. Castiglione itself was founded by the Romans under the name of Salebrum. 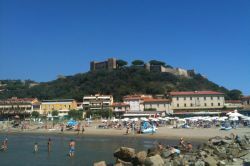 In the 10th century, after the fall of the Roman Empire, Castiglione became part of the sea republic Pisa. The first watch tower was built and later on the walls. In the second part of the 15th century, Alfonso d'Aragona, King of Naples, transformed the towers into a castle. In 1559, Castiglione became part of the grand duchy of Tuscany. The Medici, followed by the Lorraine started to drain this marshy area. Today, Castiglione is a small seaside resort with characteristic historic centre, where one can walk in the alleys between shops, restaurants and wine bars. Following the alleys up the hill, one arrives at a gate that is the entrance to the oldest part of the centre. It is worth continuing further up until the end, because from there one will have an unforgettable view over the sea from Castiglione until Principina a Mare, the Daccia Botrona, the characteristic rose house "casa rossa" and during limpid days one will also see the Islands of Giglio and Elba. Part of the centre, also the antique harbour, today yacht harbour. At the end there are still the fishing boats and a small fish market with fresh fish. 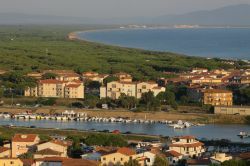 On the coast, only a few kilometres further north, one will find the luxurious seaside resort Punta Ala with golf course and polo field as well as Follonica, famous for the long beach, with many shops and restaurants, embedded between the gulf of the same name and the Maremma landscape. Towards south, one passes through extensive pine woods until reaching Marina di Grosseto or Principina a Mare, from where starts the Parco Naturale della Maremma. This Nature Reserve is extending until reaching the Argentario coast with Talamone, Porto Ercole and Porto S. Stefano (ferries to Giglio and Giannutri). The hinterland invites with charming villages of antique origins like Tirli, Scarlino (with medieval castle) and Vetulonia (Etruscan excavations), where it is still possible to taste a genuine Tuscan cuisine, mainly based of game. It is also worth visiting the enchanting Massa Marittima with one of the most beautiful squares in Italy. Small alleys are winding up the hill, offering picturesque views over the Maremma hills and the Gulf of Follonica.